News from the 2014 nesting season for ospreys at the Forsythe NWR Osprey Cam. Scroll down to start from the beginning of the season. Ben Wurst gives a thumbs up after successfully fixing the osprey cam! Well, after three months of "down time" the camera is back online and our ospreys have flown south. While we do not know what caused the camera system to go offine in late July, we do know that it was nothing serious. Upon arriving at the nest we saw that the IR and transmitter were getting power (sweet! no lugging huge batteries off the marsh!). Solar charge controller light was flashing indicating that it was under a float type of a charge. We tested the voltage of the batteries = 12 volts = check! So why wasn't the camera transmitting? Somehow power was cut off from the camera and audio encoder via the network switch (we've already replaced the switch once...). We reset the whole system (by disconnecting the power) with hopes that the camera and audio (still not working properly) would come back online and they did! So, how do we ensure this does not happen again, especially in late July? We're not sure (since we don't know what caused it) but we will be working to figure it out this off season so we know we'll be good for next year. On top of that, we'll be planning to replace the mircophone wire, install a better wind buffer and possibly install another camera on the actual nest. Camera is down until further notice. We could not connect to the camera or any other camera components at Visitors Center. Sometimes good things go bad... The three young are about to fledge and camera is offline. The weary eyed 6 1/2 week old osprey nestlings. See the downy feathers in the nest? Sorry for my lack of updates lately! I've been busy surveying many other osprey nests throughout the Atlantic coast of New Jersey. The young ospreys are now almost 7 weeks old and almost ready to fledge! At this age they are almost fully feathered. You can see their downy feathers are being lost (they're all over the nest) and replaced by their body and flight feathers. Their feathers have bluff colored tips. This helps distinguish them from adults. It also gives them camouflage while still in the nest. After they do start to fly the tips of their feathers begin to wear and the buff coloration fades away. Some believe that the adults use the buff coloration to identify them as young ospreys, and that they are not a threat to them. I've personally seen juveniles that move from nest to nest to perch and the adults do not care (one nest once had 5 young perched on it!). As the young birds learn to fly and hunt, their lighter coloration will ensure that adults will not harass them. View photos from my "osprey adventures along the Jersey Shore"
Banding day is here! I'm kicking off the 2014 Osprey Nesting Surveys by banding the three 3.5 week old young at this nest this evening (starting around 5pm). While there I'll also be checking all the other nests around the Wildlife Drive at Forsythe NWR. I'll be assisted by the interns who work at the refuge. I'm hoping to check the sound for the Cam to figure out the crazy static that it's plagued by...So, if we're lucky we'll have working sound from the nest after today! The oldest two nestlings are now 18 days old (youngest is 15 days old). Their body and flight feathers are growing very quickly. We age all young ospreys by their feather development. When we go out to conduct annual nesting surveys, starting next week, we climb up to nests and age them using this method. Young that old enough to band (at least 21 days) are banded with a silver USGS lock-on band on their leg. It's used to learn more about their site fidelity, migration routes, and life span. Watchers of the cam really see how much fish the male osprey has to catch to feed himself, his mate and all three young. He has really been catching a good amount of large fish. Some have even provided enough food for multiple feedings! But, there is still some sibling rivalry. The older nestling(s) tend to peck at the little ones. This is quite common in raptor nests, as young can and do compete for food. In years with a shortage of fish or prey then the younger nestlings would not survive. This would be tough to view on the cam, but at this point in their development we don’t think it’ll occur here. It's really amazing to watch and witness how fast these creatures grow! The youngest nestling is now 8 days old and is no longer much of a runt. At this age it's clear to tell who is young and who is old... The older nestlings have a darker appearance, with their body or contour feathers emerging from pin. They will develop a white line of feathers on their backs, which mimic light colored nesting material in the nest. This gives them a nice camouflage while laying low in the nest. The adult female has been doing an awesome job of caring for her young. She feeds them, broods them at night, and shades them during the day. With Father's Day around the corner, we'll highlight his duties later this week. In other news, I'm sad to report the passing of a true legend to New Jersey and our environment. Paul "Pete" McLain passed away last Friday. Pete was instrumental in the passing of the Endangered Species Conservation Act of 1973. He preserved thousands of acres of pristine open space from development, and restored populations of endangered wildlife, including bald eagles, peregrine falcons and ospreys. Pete's legacy will live on in all of the people that he educated over the years and all of the species he's helped to save. I've been lucky enough to have the chance to monitor and manage New Jersey's ospreys since 2004. Many people praise me for the work that I do to help ospreys, BUT it was Pete's hard work and dedication that brought ospreys back to the skies of New Jersey. I would probably not have a job if it weren't for all of his lifetime achievements. Without doubt, I'll be dedicating this field season in memory to Pete. Nesting surveys for osprey begin on June 23rd. You can read his obituary and see old photos here. The male brought back two large catches of white perch in the last 16 hours. One yesterday evening and one early this morning. We now have three hatchlings! The first egg hatched in the morning on day 40 of incubation, and the second hatched later that day. The third egg hatched on June 1 in the early morning hours. They're about 3 days apart in age. The older young will compete for food (and win) over the youngest, however, when there is enough food even the "runt" will get his fair share. Over the last 16 hours the male, who is the sole provider of food at the nest, brought home two very large white perch. The fish were so large that they could use it for several feedings, leaving it in the nest between them. When there is enough food to go around then all young have a good chance at surviving to fledge. We are watching the plastic in the nest and will take action if necessary to remove it. Our policy is only to act when a bird is in a life threatening situation. Us entering a nest creates disturbance which might cause even more harm (more so when a bird is potentially entangled). Extreme care (and patience) must be taken in these types of situations. Trust us. We'd LOVE to not see the trash in the nest, BUT this is a teachable moment for all who are watching the Osprey Cam. Please share our post on Facebook and encourage your friends to pick up the next piece of litter they see or to not release balloons! If we all act, then we can all make a difference! We have hatching!! One little guy was seen around 10am this morning in the nest!! Around noon it got its first feeding! Osprey young are born semi-altricial, which means that they are downy and can see but need very close parental care to survive. They are around the size of a tennis ball after hatching. Check out photos and join the conversation on our "Osprey Cam Interaction" page. Day 36 of incubation and no signs of hatching yet. The average date when young hatch in New Jersey is 35 days. Incubation can last up to 42 days though. Day 38 of incubation is here with no signs of hatching. We all were expecting the chicks to hatch on time, but with the cooler than average temperatures this spring, I'm not surprised that they are a little behind. I changed the camera settings to keep the cam zoomed in real tight to give us a good view of the eggs to look for pipping. This is really when I wish the camera was installed right on the nest platform... Maybe we'll think about moving it this off-season to get a closer view of the nest. Hatch watch begins! Today marks the 34th day of incubation. Ospreys incubate eggs for an average of 35 days in New Jersey. Eggs hatch in the order that they were laid, so the first egg could hatch on Memorial Day. Ospreys exhibit asyncronous hatching, which is a natural adaptation to account for the availability of prey during the nesting season. The older young usually out complete younger nestlings for food when prey is scarce. When prey is plentiful, then there is more likelihood that all young will survive. A small raccoon goes under the osprey cam nest. The nesting pair had an unwelcome visitor on May 8th. When I tuned in to watch, I saw the female (who was incubating, male off fishing) looked nervous and was calling. She was upset. Then I panned the camera over to the perch and saw a raccoon beneath it. He was searching for and eating any prey remains that he found. Then I watched as he made his way towards the nest. The female got up and started to dive bomb him repeatly. He even was so bold as to go right underneath the nest. Luckily he did not try to climb up (though I would have liked to see it), and the nest is protected by a aluminum predator guard. Raccoons are the main ground predator of osprey eggs and their young. Predator guards are the most important part of any osprey platform! In other news, only 12 more days until we should start to see hatching! The male incubates as the female takes a break to feed herself. Males do around 30% of incubation duties. Today is day 18 of incubation or right around the mid-point of egg development. So far all has been quiet around the nest. I've heard that all nests at Edwin B. Forsythe NWR are occupied this year. This is the first time that all are occupied. You can view all known nests in New Jersey on Osprey Watch, a global osprey watching community. If you know of any new nests or watch a nest, then you are highly encouraged to map (or find and follow) your nest. Since ospreys nest is such close company with people, their nests are very easy to watch. The data entered on Osprey Watch will then be used in our annual osprey surveys and report. Three eggs are clearly visible on April 26th. Hatching should begin on Memorial Day weekend. Three eggs! I have to say it has been a tough to get a glimpse of the nest bowl and eggs. There are so many plastic mesh bags in the nest and one in particular has been blocking our view! At least for a little while on the 26th, viewer Jim Bowie, was able to grab this screen shot of the eggs. Ospreys start incubating after they lay the first egg and they hatch in that same order, or asynchronously. Male osprey forage from courtship through incubation until after the young fledge. He also does around 30% of the incubation. You'll notice that when he returns with a fish, he almost always feeds himself first and often eats the head first. Yum! Fish brains! The first egg was laid in the late afternoon on April 19 around 4:30pm. Thank you to our dedicated cam watchers who reported it to us. The second and third eggs should be laid this week. Check out a photo of the egg on our Facebook page. Osprey incubate for around 37 days in NJ (up to 42). The eggs should start to hatch around Memorial Day. The female brought in this clump of grass roots to spruce up the nest. Besides the naterual nesting material, you'll also see that they've brought in a good amount of man-made trash. The pair has been actively bringing in nesting material to "spruce up" their nest. Besides the natural nesting material that they have brought in, they have also brought in some unnatural nesting material. This unnatural material is a potential hazard to the nesting birds and their young. Birds can become easily entangled in ribbon, monofilament, rope and injury or death can occur. We could go out and remove the mesh bags and ballons with ribbon, but we would rather leave the debris and use the camera to act as an educational tool for watchers to become enlightened that marine debris is an ever growing threat. Please act responsibly and pick up trash when you see it. 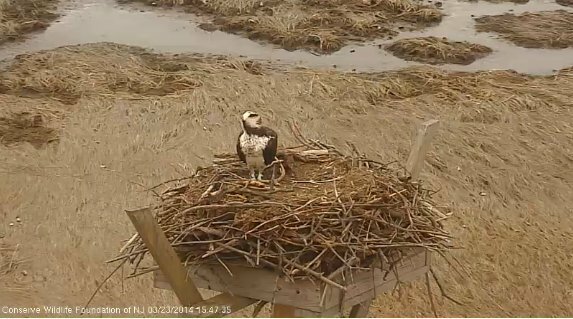 Welcome to the second season for the Edwin B. Forsythe NWR Osprey Cam! While many of our ospreys have returned to New Jersey our Osprey Cam decided to go down. :( During the snowstorm on March 24th we lost connection with the Cam. Later that week (3/27) I went out to examine the camera components and found that the network switch was bad (no birds were present at the nest). A new switch was shipped up from Florida and installed on April 1. The only thing I can think that happened was that snow blew into the component box (which has small holes to allow some air in) and got into the ethernet ports on the switch. I'm just glad this happened at the beginning of the season and not in the middle, like last season when the cam went down in mid-July. It just goes to show that keeping a camera online in the middle of the coastal saltmarsh is NOT an easy task! We had an unbanded female visit the nest on 3/23. She was clearly just passing through. The 2013 unbanded female (ID'd by her distinct brown necklace of feathers) returned first, on 3/30. The camera was down at the time. The 2013 unbanded male (not confirmed yet but I plan to look at more photos of him from 2013 and will post in the next entry). He arrived on 4/3. View the location of this nest on Osprey Watch. Here you can se past nesting history of this and all other known nests in New Jersey. Check out our all new Osprey Cam Interaction page where you can leave comments, questions and post photos from the Osprey Cam. The late season snow storm that took out the Osprey Cam for 7 days in late March. Ospreys are currently on their wintering grounds in the south in Central America, Caribbean, with largest concentrations in N. South America. Later this month birds will begin their spring migration back to their breeding grounds in the Northern Hemisphere. In NJ, typically most birds arrive in late March, with a few arriving during the second week of March. In the meantime, we'll be busy making sure the red carpet is rolled out for their return by making sure nests are in top notch condition. Each year we install an average of 10 new platforms, some to replace old nests and a few new ones to help expand the population. As far as the camera is concerned, since we replaced the solar charge controller in late 2013, all is well. One trip will be undertaken to the camera to install conduit from the battery box to the camera, adjust the IR light, and try and straighten out the camera on the pole by adding a shim. We're planning to conduct this work during the first week of March.